Movement was one of the main differences between the East and the West during the Cold War. While the Western NATO allies were beginning to form what we now know as the European Union (which is fundamentally based on four freedoms all involving movement: the free movement of people, goods, services, and capital), people living behind the Iron Curtain were restricted in their day-to-day life. The place where these competing systems were in direct juxtaposition was the Berlin Wall, the dividing point between East and West- with freedom mere meters away. Despite being divided like the rest of Germany, the actual city of Berlin sat well behind East Germany’s border. Until 1952, crossing between East and West Germany was relatively simple. However, the leader of East Germany and Stalin became increasingly suspicious of Westerners crossing into the East, and a barbed wire fence was erected on the East/West German border. The borders between East and West Berlin, however, remained physically undivided, and getting to West Berlin became the easiest way to escape to West Germany. By 1961, when the Berlin Wall was constructed, 3.5 million East Germans, mostly young and well educated, had left. 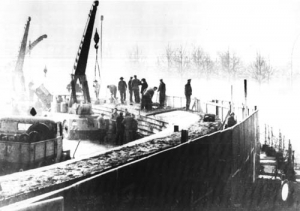 In order halt this mass emigration from East Germany, East German State Council chairman, Walter Ulbricht, and Soviet Union leader, Nikita Khrushchev, discussed the possibility of building a wall. On August 12, 1961, Ulbricht signed an order to officially close the border and build a wall. Checkpoint Charlie as seen from East Berlin. Discover more from the Cold War Museum through the photograph. 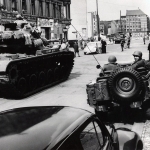 Checkpoint Charlie (Friedrichstrasse) was the best-known west-to-east crossing on the Berlin wall. It was the only crossing open to non-Germans and Allied military forces. The checkpoint was the site of a U.S.-Soviet standoff during the 1961 Berlin Crisis, when Soviet officials stopped a U.S. diplomat from entering East Berlin. Five days later, U.S. and Soviet tanks were lined up and facing each other on either side of the checkpoint. The standoff was peacefully resolved the next day. 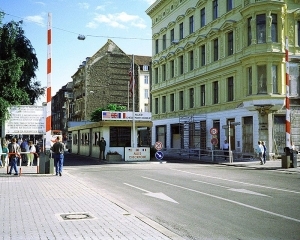 As the most visible and famous checkpoint, it was often featured in films depicting the Cold War Era, and remains a popular tourist attraction for those visiting Berlin. Vita Cola. Discover more information on life in East Germany through the photograph. Once the wall was erected, emigration from East Germany became much more difficult. Many families were split and became unable to visit each other. The wall also prevented Western goods from entering East Berlin; for example, East Germany developed its own version of Coca Cola, Vita Cola, to keep western influence out. The wall also slowed down the flow of information from West Germany to East Germany; however, people continued to smuggle newspapers in from the West, and East Germans could still listen to radio broadcasts from Western stations like the BBC and Radio Free Europe (however, this was illegal and East Germans could be punished if they were found out).